After payment, it will take approximately 5 business days to prepare and ship this item (excluding holidays). Red Rose - passionate, sincere love Pink Rose - Special Care Send a bunch of meaningful bouquets Dedicated to the other person Mother's Day bouquets, graduation bouquets, lovers, and elders are all suitable. The color is red and pink. Please inform the color system. If you do not inform, please ship it randomly. 【Product desciption】 ● Use no rose, Sola peony, and flowers as random primary colors. ● Dry flowers are all dried with dry flowers. It is inevitable that the drying process will drop. The flowers will be properly packaged and delivered to your hands. ● Diameter size: The bouquet contains about 28/40 cm of package size. (don't imagine) ● The bouquet wrapping paper is made of Korean imported waterproof wrapping paper, gray. ● Dry flowers are hand-made works. Each one will not be exactly the same. It will inevitably have a color difference. This is also the original intention of hand-made goods. Please think twice before the perfectionist makes a reservation. ● Dry flowers are mostly imported. If there is a shortage of market or the quality of the flowers is not good, please let the flowers be professionally matched with the suitable flowers. The overall shape will not be changed. Please think carefully before buying. [Remarks] ●Select the time for picking up the goods for 48 hours. If the works are incomplete and the damage is high, please think twice before using the supermarket to pick up the goods. If the work is damaged, the buyer will bear the responsibility. ● The shipping cost is the estimated shipping cost. The actual price is the amount when you send it. (Sometimes the designer also pays the shipping fee, please understand each other.) The subscript indicates that you agree to the shipping fee set by the designer. If you cannot agree, please do not place an order. And use this reason for refunds and returns. ● Good flower works use primary color flower materials, and do not overuse brightly dyed flowers to make works. It is the original intention of good flowers; good flowers are also loved by the original beauty of dry flowers. I believe you will also like dry flowers. Original posture and beauty ● Before placing the order, you must confirm whether there is any stock. The production time of the hand-made works is about 7-10 days, and the large-scale works are more than 14 days. If you want to send an urgent item, you can ask the private designer to ask about the time. ● If you have any questions, don't worry, press the contact designer immediately, or give me a private page. The designer will quickly and help you solve and answer the questions as soon as you see the message. ● The works are all measured by hand. It is inevitable that some errors will be forgiven. To ensure your rights, please confirm in detail before ordering. ● Discuss custom colors with designers before placing them. If they are not asked, they will be sold separately喔 [Flower ceremony maintenance method] ● It’s better to be afraid of the sun and the sun, so it’s better to put it in a ventilated place. ● Good flowers can be kept for a long time, depending on the owner's care status, the color is faded or the flowers fall. ● If you have dust, brush it with a soft brush, or use a hair dryer to cut cold air. 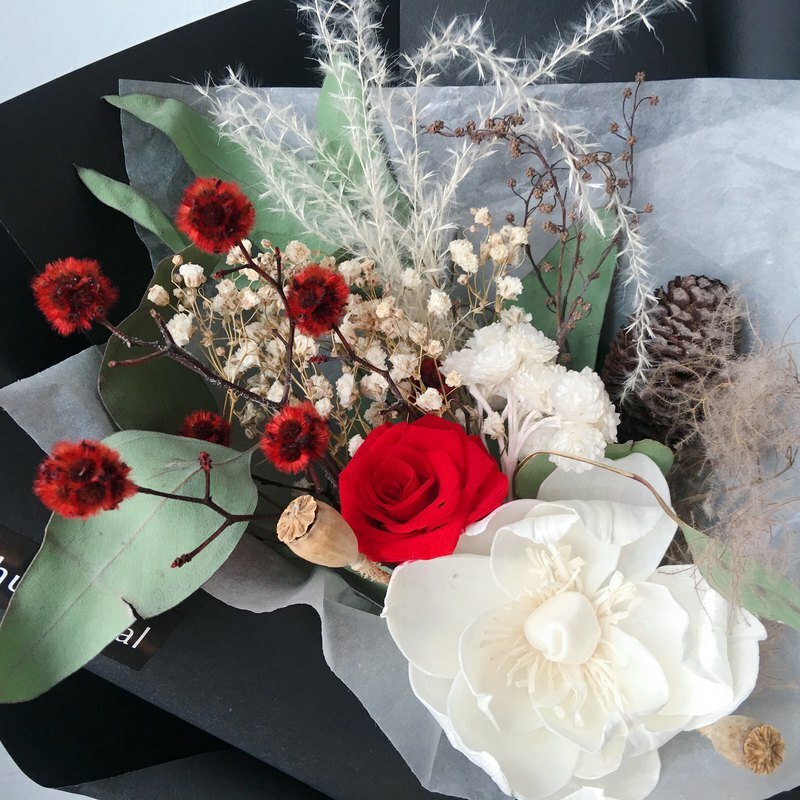 【Packing】 In order to respond to environmental protection, the good flowers are all packed in recycled cardboard boxes, without excessively beautiful packaging. All works are natural materials, it is inevitable that some flowers will fall during the delivery process; however, please don't worry, the fixed flowers will be properly protected before shipment, and the perfect works will be delivered to you. [brand story] Good flower, good for you Give you good things, a good thing Dry flowers, love its unique and aesthetic taste The original posture presented after the flowers recede It’s another wonderful start for the flowers. Also because dry flowers can be stored for a long time, I want to make beautiful happiness for the pollen who loves good flowers. Keep the original characteristics and colors of the flowers, Make a floral gift that is textured and smiling [after-sales processing] Please read the above information carefully. The order also accepts and agrees. The works are handmade. The return of the refund will not be accepted for personal factors (not in line with expectations, size is not suitable, etc.). If there is serious damage after receiving the flower ceremony, please submit it within 2 days of receiving the gift, and take photos and contact with the flower, and return the processing according to the situation. After the coordination between the two parties, if you need to return or repair, please Returned within 5 days, the return shipping costs must be borne by the buyer, and will not be accepted after the time. Good flower studio, all things are handled by one person. There are many dry flowers sellers on the market, and the studio is not easy to operate. If you have any questions, please discuss and understand each other, let us have a happy and beautiful trading process. If you like a good flower, please give us a positive rating of 5 stars after receiving the product! These positive comments are the driving force for good efforts to continue to advance.